Sofia and Maddi are best friends who play in the park every day. Sofia's refrigerator is full of food while Maddi's fridge is empty. 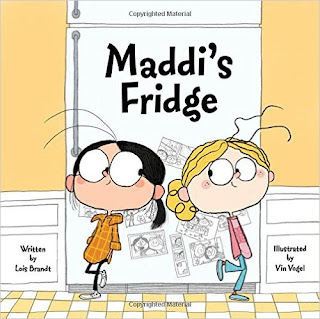 Sofia discovers Maddi's empty fridge after playing in the park one day and learns that Maddi does not have enough money to pay for nutritious food to eat. Maddi asks that Sofia keep her secret and not tell anyone about her fridge. This story is about a young girl who struggles between keeping her best friends secret and trying to help. Ultimately doing the right thing Sofia attempts to bring Maddi food every day, until she finally tells her mother and they bring over food to stock the fridge. Overall, this book touches on the important issue of hunger and raises awareness about how to help. This book falls in line with element five because it is about raising awareness on an issue that many people around the world face. Hunger is an issue that affects people from all different communities and is not usually discussed. Students may realize that people in their own classrooms can not afford to stock their refrigerators with healthy and nutritious food. This book allows children to gain an insight on whats right and wrong when it comes to helping people who can not afford to buy healthy food for their families. This book is also element five because the main character Sofia decided that she did not just want to keep Maddi's secret but she wanted to help and raise awareness about an important issue. One activity that can be used with this book is having the students in your class create flyers and pamphlets about hunger in their communities. They will first read the book and then discuss ways they can raise awareness about childhood hunger. Once they have decided on their ways, they can pair up or work in groups to create something that will raise awareness and hang them around their school and community. They can also put together a food drive to help local families who may not be able to stock their fridge's with healthy and nutritious food.